���Appointed at only 15 minutes from Sibiu, Fantanita Haiducului Hotel supplies not only a bed and breakfast location, but a complete relaxing accommodation unit in Sibiu, modernly fitted, with a wide range of travel services, from dining to comfortable rooms. 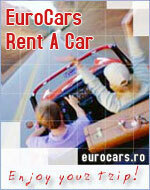 It might become the ideal vacation rental in Sibiu. ���The hotel in Sibiu comprises 34 rooms as it follows: 4 suites, 4 duplex suites, 3 studios, 20 doubles, 3 singles, antialergical rooms, disabled facilities and non smoking lodging units. ��Classical elegance, it is suitable for special events: weddings, official parties, banquets, supplying 180 seats. ��Traditional atmosphere and Romanian hospitality will join your hours in here. ��You are about to spend great moments in the retro outlook of the '80-s.
��2 council halls�and a conference one render successful events or corporate meetings, each of them being equipped with Internet access.